What are your most popular seeds? Do you circulate any other unusual items? Seed sieves to be ordered […] We also lend book bags that our knitting group made from recycled materials as part of the Bagshare Project. Where are your seeds listed? What advice or interesting stories would you like to share with other librarians? Outreach is important. For example, volunteers had a table at the Farmer’s Market, gave out packets of marigold seeds and made “seed bombs”. 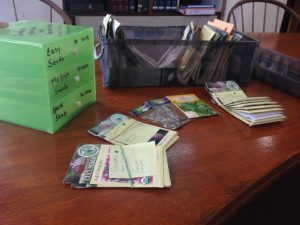 Our Seed Library volunteers meet periodically, and offer garden-related programming. A wheel barrow donated by Gaylord Friends was used as a raffle prize to raise funds. 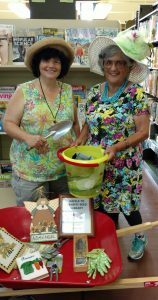 Photos attached: Gaylord Seeds and Stories organizer Marie Rohan and volunteer Wendy Farley with raffle prizes, and some of the seed packets available. This entry was posted in Library of Things by laura. Bookmark the permalink.